Pictures were from my camera and a few other photographers. From Left to Right – Hamsul (photographer), Hj Eddy, Rawi, Azli, Yahaya and Suhimi Siba. Some of the Brunei TRI-athletes before the swim. The event start exactly at 8am and to me it was quite late. They should try to start a bit early like 7am. One of the best pictures of me. I completed my swim around 25 minutes which was very fast to me. My time should be around 30++ minutes. I guess the swim distance was shorter. T1 to Bike was around 200m and have to run if you want to cut short your transition time. For this triathlon, I’ve decided to wear a one piece tri-suit instead of a 2 piece tri-suit because its been a while since I use my 1-piece tri-suit. On my bike, I look more tanned – skin look darker. That was the result of swimming in the afternoon during lunch time. Azli and Zaeidi on their bikes. Azli’s swim time was very fast than mine. I’ve managed to caught a few cyclists and form a small group, taking turn taking the lead and the others drafting behind. Yahaya managed to catch the group and he did stay for a while with the group and then he just break away from us nowhere to be seen. A few from the group followed him but I just stayed on my current speed pulling a few other cyclists. I know my limit, so I just stay on my current speed and hopefully I can catch him on the run (I did). My bike time was around 1:09 minutes and the distance was around 40km. 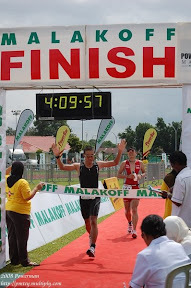 My K-Swiss IRONMAN shoes in its 2nd event competition. The first was the UBD 9km Convo Run. I’m getting use to it even though I still prefer my Nike Air Zoom speed pink shoes. Managed to finish my 10km run in 56 minutes and I was very satisfied with it. My total time was 2:33:34. Zaeidi was 2 minutes behind me and his run was very fast around 52 minutes. 4 of us managed to get top 15 to get the prize money. Zaeidi and Ahmad in their age category of 16-29 years and Hj Eddy and Me in our age group of 30-39 years. I have achieved my target of getting the top 15th and I was number 15th. Lucky for me. Who is this guy? I don’t even know him but I like his tri suit color. PINK color.